Carolina Seafood and Steak, you don’t have to choose. “We give you both – land and sea,” said restaurant owner Tevos Zatikyan. The Myrtle Beach eatery, located along Restaurant Row, specializes in surf and turf combination plates, serving up fresh seafood and Certified Angus Beef. “We are proud of what we’re serving,” Zatikyan said. Our Cheff Arabe has helped focusing on creating a strong identity for the restaurant while continuing to provide the highest quality meals. fresh seafood comes from local fisherman out of USA. We will feature daily specials, include a pasta dish of the day and a seafood catch of the day, for customers to try something a little out of the ordinary. Our menu will also showcase the restaurant’s brick oven, with delicious flatbreads as a popular option. We want to be tolerable to our customers’ needs. We can create things on the spot and offer substitutions. “I like to let the ingredients shine,” the chef said. We enjoy staying up-to-date with new trends in food and sometimes we love to step outside of the box in the kitchen. Zatikyan, who’s lived in the United States since 2006, is married, and he and his wife, Aksana, have three children. “I came to the USA and opened restaurants because I like making people feel Happy and make them smile and enjoy, he explained. Zatikyan played professional volleyball for 14 years, and he brings the importance of teamwork to his work in the restaurant. When you eat at his restaurant, Zatikyan and his team aim to provide quality customer service. Carolina Seafood and Steak is “actively working with the community” to be a vital asset to the Grand Strand Area. The restaurant’s early bird menu is a favorite among visitors and locals alike. Happy hour specials are also offered in the bar. The 14,000 square-foot historic building includes the main dining room, a sunny garden room with a glass roof, the bar, the wooden room with natural wood walls, and the Carolina Lounge and Bar. The lounge includes a dance floor and can be reserved, equipment and DJ included, for private parties. The restaurant regularly features live entertainment with a variety of musical genres represented. The building that houses Carolina Seafood and Steak was built in 1969 and contains many beautiful remnants, salvaged from the former Ocean Forest Hotel which was Myrtle Beach’s first hotel. The magnificent wooden arches, built in 1927 and now dividing the restaurant’s rooms, and the actual bar were originally part of the historic hotel. The stunning stained glass on the ceiling in the bar and the glass behind the bar were salvaged from a church in Spain. 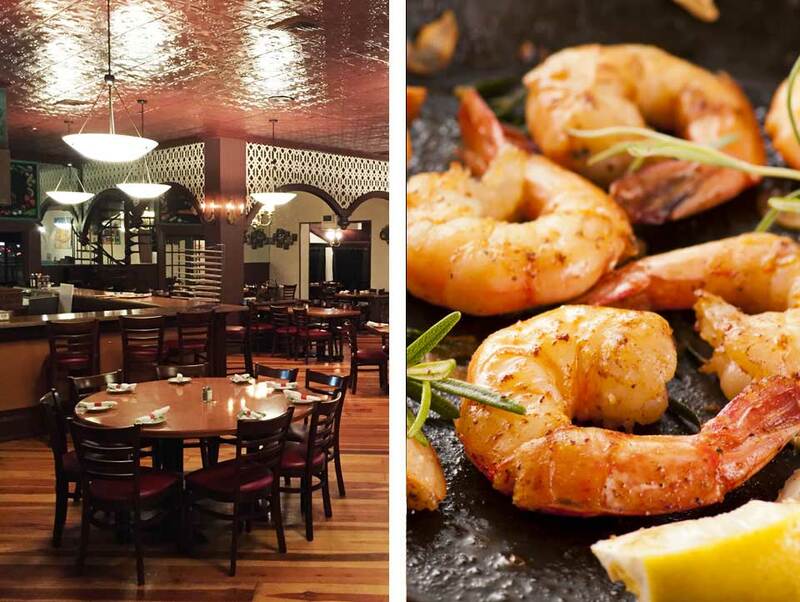 The restaurant’s large kitchen makes it possible for Carolina Seafood and Steak to host large parties, wedding receptions and other gatherings. The restaurant can provide a la carte meals or buffet-style dining for your event.